One of the most challenging aspects of preparing great food every day is finding the time. Like all worthy endeavors, it seems we could always use more time for menu planning, grocery shopping, food prep and cooking. We can ready ourselves for a busy week by over-cooking on the weekend and planning for multi-use meals, but time often still escapes without the chance to fully prepare for the hungry bellies sure to show up after a long day at school, on the sports field or at the office. So what can we do to improve our chances of eating fresh and healthy, even when time conspires against us? Now that May has arrived and growers markets across the state are beginning to open for the season — or in the case of Santa Fe, getting back to their two-day per week schedule — it’s getting easier once again to shop for the freshest, locally grown food. Do you still need to remember to go shopping? Yes. Do you still need to squeeze it in between walking the dog and other commitments? Yes. Will you still need to stop elsewhere for milk, oil and other staples? Yes. But once you make going to your local growers’ market part of your weekly shopping routine, you’ll be well on your way to improving not only the quality of your meals, but also reducing the time it takes to make great food. How does using locally grown food save time in the kitchen, you ask? Two key words — fresh and flavor — provide the answer. Uber-freshness means the food requires little or simple preparation. 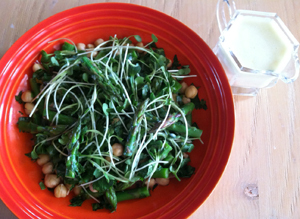 The flavor of raw ingredients in stellar salads, for example, will speak for themselves when time is short. Once the bounty is in your refrigerator, all you need are a few chops, a few peels and a few tosses to create amazing plates full of goodness. This time of year, look for the world’s best lettuce, spinach, kale, turnips, microgreens, sprouts, radishes, asparagus, strawberries, spring onions, parsnips, goat cheese, honey, eggs and more on market tables. When you’re at market, don’t think too hard about exactly what you will make — just buy plenty of the foods you like. You’ll always find ways to use foods you enjoy, but if they’re not in your refrigerator or produce drawer, it’s much harder to be creative when it’s time for a quick meal. Try making your trip to market a full-fledged grocery excursion. While it can be relaxing to have a cup of coffee as you stroll the market aisles, remember the food you buy is so fresh it will last extremely well (if you don’t eat it all immediately! ), so bring a rolling cart or big basket with you so that you can stock up for the week ahead. Salads are a natural choice this time of year, and adding new twists like whole grains, fresh fruit, nuts and homemade dressings will help you zing into spring with minimal effort. No matter what you buy at market this month — spinach, kale, salad greens, radishes, asparagus, strawberries or other goodies — your local farmers are bringing you the best the season has to offer straight from their fields. When it gets to your table, you know the food has only travelled a short distance, and that it is still vibrant, healthy and full of flavor. It could be argued that the most valuable thing we have in this world, outside of our health, is time. Time is a resource that can’t be bought, rented, borrowed, stored, saved, renewed or multiplied. When it’s gone, it’s gone. For a great return on your precious investment, be sure to spend some time at a growers market this spring.